The Perth Mint of Australia has released limited mintage gold and silver coins which celebrate British actor and filmmaker Sir Charles Spencer ‘Charlie’ Chaplin KBE. The release of the coins this year coincides with the 100th anniversary of Charlie Chaplin’s first film appearance, the 100th anniversary of the screen debut of The Tramp, and the 125th anniversary of the artist’s birth. The proof quality 99.9% pure silver coin features a lenticular design to depict Chaplin’s character The Tramp. Through the use of lenticular lenses, the character appears walking jauntily as depicted in the closing scenes of the 1928 silent movie The Circus. The image is bordered by the inscription “Charlie Chaplin” with the precious metal weight and purity “1 oz 999 Silver” also present. The obverse of the coin contains the Ian Rank-Broadley effigy of Queen Elizabeth II, along with the monetary denomination, and 2014 date. The coins are issued as legal tender under the authority of the government of Tuvalu. Each coin has dimensions of 47.6 mm by 27.6 mm. There is a maximum mintage of 5,000 pieces. The coins are housed in a display case and shipper with a numbered certificate of authenticity. 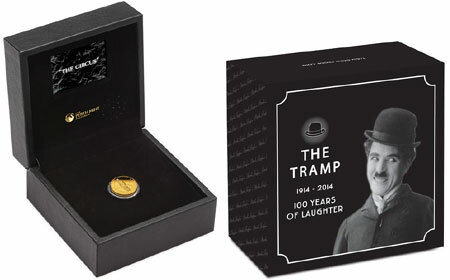 The proof quality 99.99% pure gold coin features a portrait of Charlie Chaplin’s character The Tramp. 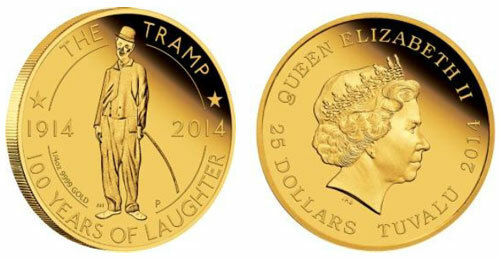 The surrounding inscriptions include “The Tramp”, “100 Year of Laughter”, and the anniversary dates “1914” and “2014”. The precious metal weight and purity of “1/4 oz 9999 Gold” also appear. The obverse design of the coin contains the Ian Rank-Broadley effigy of Queen Elizabeth II with the legal tender face value and 2014 date. The coin is issued as Tuvalu legal tender. Each coin is struck in 99.99% pure gold with a weight of 7.777 grams and diameter of 20.60 mm. The maximum mintage is indicated as 1,000 pieces. The coins are issued in a black display box which incorporates a mini MP4 player and screen. When the lid is opened, the screen plays a short clip of the 1928 silent movie The Circus accompanied by music. A numbered certificate of authenticity is also included. 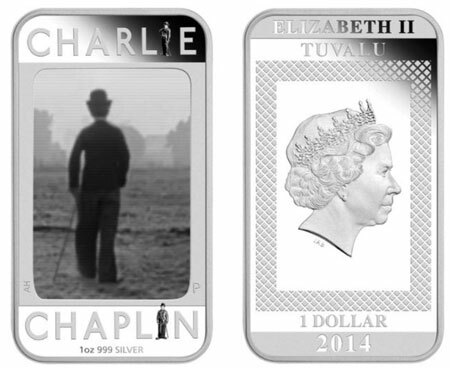 For additional information on the 2014 Charlie Chaplin Gold and Silver Coins or to place an order, please visit the Perth Mint website.